Groundbreaking banjoist/composer/bandleader Bela Fleck reconvenes with the original Bela Fleck & The Flecktones, the extraordinary initial line-up of his incredible combo. While all manners of genres come into play - from classical and jazz to bluegrass and African music to electric blues and Eastern European folk dances - the result is always an unforgettable performance. Bela et al will be reuniting for a very special two-week only tour this summer, hitting Tower Theatre OKC in Oklahoma City , OK , June 24, 2019 . Sound good to you? 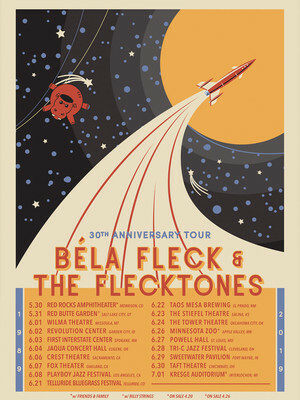 Share this page on social media and let your friends know about Bela Fleck And The Flecktones at Tower Theatre OKC.